Our Long Range Forecast this week welcomes two four new additions. First, Trouble With the Curve has been added retroactively due to its release date switch to September 21. Meanwhile, Looper, Hotel Transylvania and Won't Back Down are scheduled to open on September 28. - Eastwood, given the right material, can absolutely nail it with older audiences. - The flick opens in the same slot as Moneyball last year, just in time for baseball's playoff season. - Baseball movies skewing to older audiences have traditionally done well enough. - Amy Adams has a few diverse and strong performances under her belt lately and her own fanbase is growing. - Baseball movies are typically hard sells to mainstream moviegoers -- Moneyball notwithstanding, which had some extra help from Brad Pitt's presence and Oscar buzz. - Eastwood can be hit or miss - his last three films have received lukewarm word of mouth by fans and critics alike in J. Edgar, Hereafter and Invictus. - It could meet up with competition from End Of Watch among older male moviegoers. - Bruce Willis is still a solid draw, albeit much less than in his heyday. - The sci-fi time travel genre can be very successful at the box office when given the right script. - Joseph Gordon-Levitt has a growing following of sorts thanks to (500) Days of Summer and Christopher Nolan's last two films. With The Dark Knight Rises and August's own Premium Rush, he'll be even more on the public's mind than before. - There's some déjà vu to 2009's Surrogates for Willis. That sci-fi film had the same September slot three years ago and underwhelmed at the box office. - Despite growing critical praise, Gordon-Levitt is still proving himself as a lead and has yet to top-line a film that opened above $10 million. 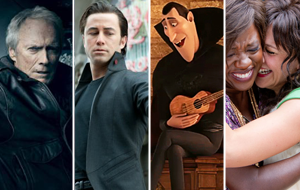 - September has delivered a few hits in recent years for animated films. - Sony also distributed Cloudy With a Chance of Meatballs in the same slot 3 years ago to great success. - Very recognizable voice talent attached won't hurt its draw, especially between Adam Sandler and Selena Gomez. - Finding Nemo 3D opens two weeks prior and could have a huge opening thanks to starved family audiences. If its legs extend further than Beauty and the Beast's did earlier this year, that's bad news for this movie. - September has also delivered its share of animated clunkers -- most recently being Legend of the Guardians. - FrankenWeenie opening one week later and boasting the one-two punch of Disney's and Tim Burton's names could spell trouble for Hotel's legs. - Solid cast with a strong story that should appeal to female adults -- particularly mothers of school-aged children. - The flick is produced by the makers of Waiting For "Superman", which turned a lot of heads and drummed up considerable buzz upon its release. - It doesn't have to break records to turn a tidy profit. - The story's material simply isn't going to translate into box office dynamite. Notable changes on our forecast this week include The Bourne Legacy, Hope Springs and The Odd Life of Timothy Green. Trouble with the Curve Sep 21, 2012 Warner Bros.